As you travel around the country, you frequently encounter soaring high-voltage towers. These structures are visible and integral parts to the backbone of our power grid, energizing millions of homes, businesses, and critical national infrastructures. The towers and wires that stretch between them must periodically be maintained and receive necessary upgrades. How are these giant structures maintained while stretching more than 100 feet off the ground? Taking it a step further, what happens when the towers span over a major interstate highway? Typically, when installing wire from structure to structure, crews use special rigs to pull it between the towers. When new wire is needed, crews walk or drive high-strength ropes between towers to pull the heavier transmission wire up into place. 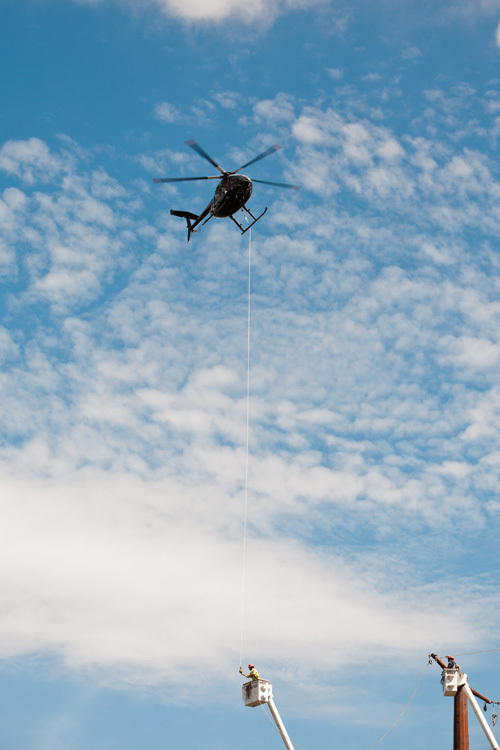 When ropes can’t be moved along the ground, it often requires help through the utilization of a helicopter. This past August, that is exactly what was needed when a wire upgrade project traversed its way through the Pocono Mountains in Eastern Pennsylvania. The kind of work required for this wire pull needed to be performed by experienced specialists. In this case, Michels Power, an established utility contractor based in Brownsville, Wisconsin, led the job for the Pennsylvania utility company PPL. Michels does more than ten such wire pulls across the country annually. For this project, they partnered with helicopter operator Haverfield Aviation Inc., located in Gettysburg, Pennsylvania. 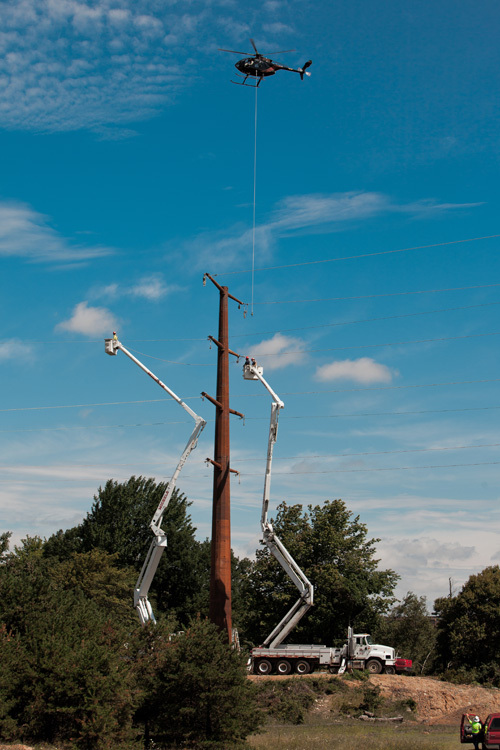 As experts in the field of transmission line installation, Michels employees needed to stay focused on the task of the coordination of pulling the wire more than 600 feet across a major roadway. 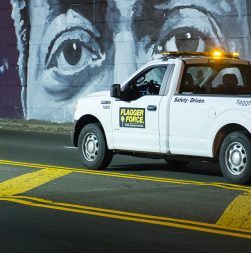 The two high-voltage towers that needed to be connected were separated by Interstate 380, a major highway in Pennsylvania that connects New York City and the state of New Jersey to the city of Scranton. The wire needed to cross near its connection with Interstate 80. Both of these interstates carry over a million vehicles each year, so the only way to safely cross the roadway was to take to the air. Even though the ropes and wires would never touch the highway surface, no vehicles could travel the road during the actual pull, per safety standards. This required one mile of clear roadway, with no traffic under the path of the wires, in both the north and southbound lanes. To complete the multiple pulls required of the project, traffic would need to be controlled for each pull that day. Michels looked to Flagger Force to manage the traffic control with a “rolling stop,” which is a temporary traffic control technique used to slow or stop traffic with the use of pace vehicles, or in this case, truck-mounted attenuators (TMAs). The TMAs have crash cushions mounted on the rear to absorb the impact of another vehicle from behind. Two TMAs were stationed on each side of the highway to slowly reduce the speed of the two lanes of traffic in each direction. This provided a gap in traffic long enough for the Haverfield pilot to pull the initial ropes across the span. For this job, each pull took a maximum of 15 minutes. 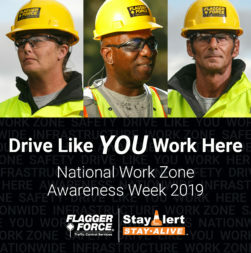 The operation required precision, communication, and coordination of the TMAs from Flagger Force, Michels ground crews, and the pilot of the helicopter to make the aerial traverse over the highway. When the helicopter pilot was ready and the lines were in place, the Flagger Force TMAs rolled into position and began slowing traffic. Once the roadways were clear, the pilot, with the precision of a surgeon, moved the pull ropes a distance of two football fields between the towers. Six helicopter pulls total were completed that day, with the entire team working together confidently. The hours of planning and coordination between the utilities, the contractors, and the Pennsylvania Department of Transportation enabled the execution of this large and complex job with very minimal impact to the traveling public.